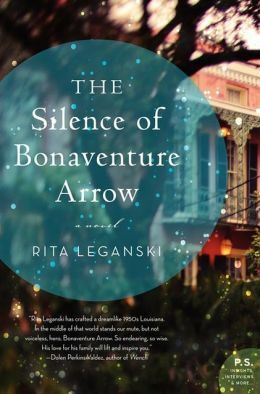 A magical debut novel from Rita Leganski, The Silence of Bonaventure Arrow is the tale of a mute boy whose gift of wondrous hearing reveals family secrets and forgotten voodoo lore, and exposes a murder that threatens the souls of those who love him. Bonaventure Arrow didn’t make a peep when he was born, and the doctor nearly took him for dead. But he was listening, placing sound inside quiet and gaining his bearings. By the time he turns five, he can hear flowers grow, a thousand shades of blue, and the miniature tempests that rage inside raindrops. He also hears the voice of his dead father, William Arrow, mysteriously murdered by a man known only as the Wanderer. Exploring family relics, he opens doors to the past and finds the key to a web of secrets that both hold his family together, and threaten to tear them apart. Set against the backdrop of 1950s New Orleans, The Silence of Bonaventure Arrow is a magical story about the lost art of listening and a wondrous little boy who brings healing to the souls of all who love him. I read this book as part of the She Reads book club. I was excited to read a book I hadn’t picked myself, but also a little nervous- the story seemed a little different. I was floored by Rita Leganski’s debut novel. From the very first page, I couldn’t put the book down.Newly born Bonaventure arrow is doesn’t make a sound, even though he is frightened by the sudden change in his environment. Instead, he listens. He hears strange and different sounds, and then the heartbeat of his mother. So begins the extraordinary life of Bonaventure, who doesn’t speak, but can hear everything, including his dead father, who speaks to him, and guides him along his life. Bonaventure hears EVERYTHING- grass growing, clouds, sunshine. He can also hear secrets. Along with his father, and healer Trinidad Prefontaine, Bonaventure helps his family heal from old hurts and secrets. I know I’m in the minority with this book – I’m glad you loved it! Oh I loved this review. I agreed with so many of your thoughts on THE SILENCE OF BONAVENATURE ARROW. We had one huge departure, where you slowed down your reading I never wanted to stop. Although, I think we were driven by the same thoughts. Glad you took the leap in the She Reads Book Club, we have been treated to some fab books this year. Love love your Firth snap and quote, no need to update. Hi! I am looking forward to the April book-I saw on your blog that you read it. Did you enjoy it? I am also looking forward to reading Me Before You- I loved her first book- The Last Letter to your Lover- read it in one day!